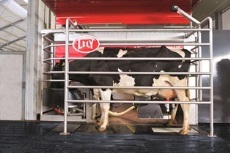 Lely North America is proud to sponsor and take part in the Precision Dairy Farming Conference and Expo this week, June 24 & 25 at the Mayo Civic Center, 30 Civic Center Drive SE, Rochester, Minn. The University of Kentucky College of Agriculture, Food and Environment and the University of Minnesota are co-sponsoring the second U.S. Precision Dairy Conference. The program includes diverse precision dairy topics with an update on experiences and developments from Europe from Henk Hogeveen from Wageningen and Utrecht universities, Netherlands. UK Ag dairy professor Jeffrey Bewley will lead a session on making sense of cow sensors. University of Minnesota's Marcia Endres will talk about factors that influence success in robotic milking and automated calf feeder systems. Industry-sponsored sessions include information management, precision feeding, and more. Ben Smink, Lely FMS Senior Consultant, will discuss factors associated with increased production per cow per day, and production per robot per day for robotic milking. In addition, 10 dairy producers from California, Illinois, Indiana, Michigan, Minnesota, New York, and Wisconsin, as well as Ontario, Canada, will share their experiences with precision technologies. The conference gives attendees an opportunity to visit these farms virtually and learn from users of cow sensors, inline milk sensors, robotic milking systems, automated calf feeders, automated TMR (total mixed ration) feeding systems, and smart barns. Program details are available online, http://precisiondairyfarming.com/2015/program. A trade show will be open June 24-25, where participants can visit with industry experts and learn more about various products and technologies available today and coming in the near future. Sponsors and exhibitors include Platinum sponsors Lely and other companies as well as media sponsor Dairy Herd Management. The event ends at 11:15 a.m. on Thursday, June 25, so participants can also attend day two of the 2015 Hay and Forage Expo held at Hernke's Dairy in Cannon Falls, 40 minutes north of Rochester.